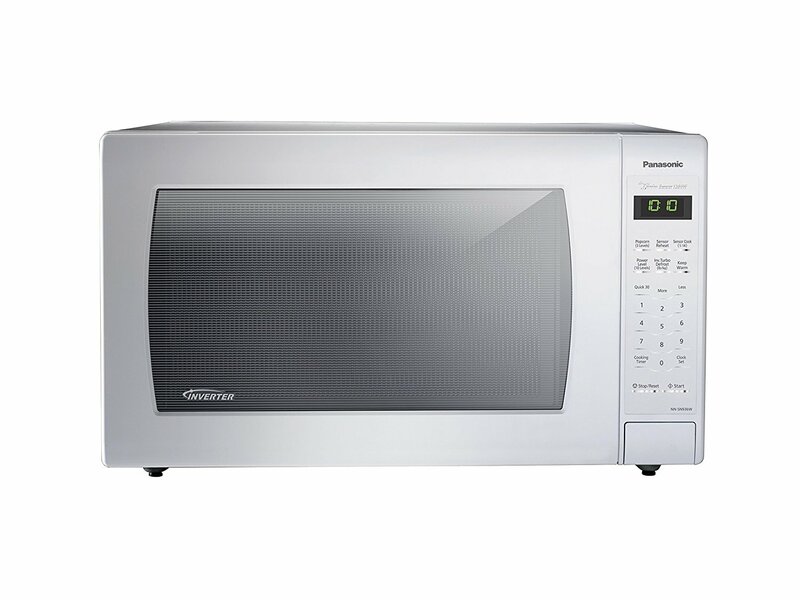 If you are looking for an advanced Panasonic microwave oven, you can check Panasonic NN-SN936W that comes with advanced features, larger cooking space and 1250 watts of cooking power. Amazingly, Panasonic NN-SN936W provides seamless stream of cooking power because it uses inverter technology. The outside dimensions of Panasonic NN-SN936W are 14 inches by 23.87 inches by 19.43 inches. It also comes with automatic sensor that senses power and times for different foods. The cavity measurement is 10.93 by 18.43 by 18.5 inches. Of course, this is an advanced Panasonic microwave oven that lets you prepare meals very easily as it comes with nine preset menu items. The Panasonic microwave oven comes with one-touch controls for sensor reheat, turbo defrost, keep warm and popcorn. This is a great unit to poach, braise and steam to perfection. Because it is powered by inverter technology that delivers microwave energy letting delicate foods simmer without overcooking. Additionally, the foods retain more color, texture and nutrients for fast, easy and delicious results.